Definition at line 108 of file RoadNavigation.C. Definition at line 114 of file RoadNavigation.C. Definition at line 123 of file RoadNavigation.C. Processing function, no video out. Definition at line 128 of file RoadNavigation.C. Processing function with USB video out. Definition at line 146 of file RoadNavigation.C. 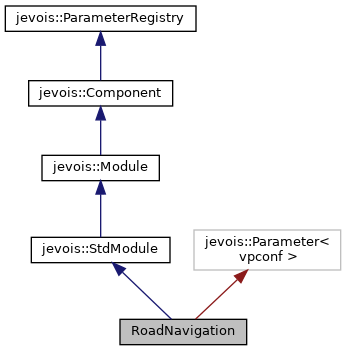 References jevois::rawimage::convertToCvGray(), jevois::rawimage::drawFilledRect(), jevois::RawImage::height, itsProcessingTimer, itsRoadFinder, JEVOIS_REGISTER_MODULE(), jevois::rawimage::paste(), jevois::RawImage::require(), jevois::StdModule::sendSerialImg1Dx(), jevois::Timer::start(), jevois::Timer::stop(), jevois::RawImage::width, and jevois::rawimage::writeText(). References jevois::rawimage::convertToCvGray(), jevois::rawimage::drawFilledRect(), jevois::RawImage::height, itsProcessingTimer, itsRoadFinder, jevois::rawimage::paste(), jevois::RawImage::require(), jevois::StdModule::sendSerialImg1Dx(), jevois::Timer::start(), jevois::Timer::stop(), jevois::RawImage::width, and jevois::rawimage::writeText(). Definition at line 204 of file RoadNavigation.C. Definition at line 205 of file RoadNavigation.C. Referenced by process(), and RoadNavigation().